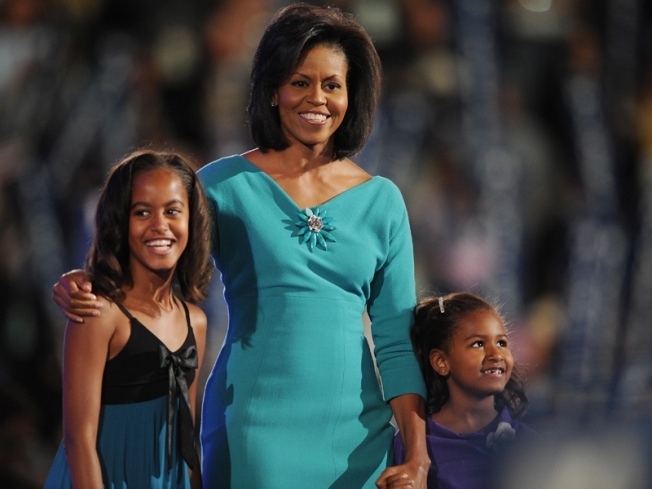 Michelle: White House Will be "Full of Life"
Michelle Obama stands with her daughter Sasha at the podium onstage where she delivered a speech at the Democratic National Convention. Future first lady Michelle Obama said in an interview aired Sunday night that she imagines a White House that will be "full of life and energy" after the Obama family moves in on January 20. As First Lady Laura Bush showed her around the White House last week, Obama said she couldn't help but imagine her daughters, Malia, 10, and Sasha, 7, running in and out of their bedrooms and up and down the halls with their new puppy and having sleepovers. "Our hope is that the White House will feel open and fun and full of life and energy," Michelle Obama said in her and President-elect Barack Obama's interview with 60 Minutes. Michelle Obama, who called Laura Bush a gracious host and "just a really sweet person," also spoke about her own role as first lady. She said she anticipates getting involved in the neighborhoods of Washington, D.C., noting that she and her husband have always tried to "contribute to the community we immediately live in." She reiterated her desire as first lady to work with military spouses as well as women juggling work with raising children. But her primary focus during her husband's first year in office will be making sure her daughters are adjusting through the transition, she said. President-elect Obama said of his wife, "I think Michelle is going to design her own role" as first lady. The Obamas said they're still in the process of deciding on a D.C. school for Malia and Sasha, who are in fifth and second grade at a private school in Chicago. "One of the things we're going to be wrestling with is how to stay normal," Barack Obama said. "Ok, daddy's president-elect, we can get to the school at 10," Michelle Obama said she told the girls the morning after the election. President-elect Obama talked about his mother-in-law, Marian Robisnon, moving to D.C. with the family, saying she is "one of the unsung heroes of this campaign." He also said Robinson is welcome to live in the White House with them, but didn't sound convinced that she would take him up on the offer. "She likes her own space," he said. The much-anticipated future first puppy the Obama daughters have been promised by their parents won't be selected for a few more months, the Obamas said. "I don't think it would be good to get a dog in the midst of the transition," Michelle Obama said. "Late winter, early spring we're going to get a dog." The Obamas acknowledged the interest Americans have taken in their puppy search. "They're ready for us to get the dog now," Michelle Obama said. "We're getting a lot of suggestions," her husband added. President-elect Obama said he is enjoying being at home every day and having his daughters come into his room in the morning and jump into their parents' bed. "It's a great feeling," he said. The Obamas said it is something they look forward to more of in the White House. Michelle Obama said she envisions Malia and Sasha coming home from school and running into the Oval Office to see their dad before they do their homework and then the family sitting down for dinner together. "This entire year and a half has brought us closer together as a family," she said. Giving their daughters a sense of normalcy in their new high-profile lives is something President-elect Obama said he and his wife often discuss. "Right now they're not self conscious. They don't have an attitude," Barack Obama said. "At the end of four years, if we can say they are who they are ? and this hasn't created a whole bunch of problems for them then I think we're going to feel pretty good."